My Italy facts: I have been to Malcesine, Rome, Florence, Venice, Portofino, Cinque Terre, Sorrento, Bellagio, Positano, the Hill Towns, Lucca, Ortisei, Portovenere, Verona, Merano, Bressanone, all the towns on lake Garda and many more. 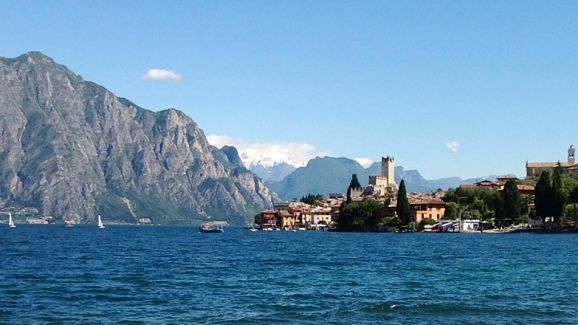 Since 2006 my wife Leslie and I have been spending part of our holiday every year in Italy, on lake Garda. We have returned to stay in Malcesine eight times since then. We keep returning because we love this small town, the cobblestone pathways, the music under the Gazebo at the harbor during the summer and the live music outside of the Café Statuto (where locals gather after a long day of work for drink, music and dancing). I also return for Linos’ millefoglie at Pasticcieria Suzy and the gelato at Cristinas’ Parfum de Glace. I better not forget to mention Roccos’ trattoria “Da Pedro” where you will probably get a complimentary Limoncello and, if you go there often enough, a complementary bottle of wine from Rocco to drink at home. I love to walk around the town late at night after all of the tourists have departed. Late at night when I walk in front of the Captains Palace it is so quiet I can hear the echo of my footsteps. As I continue to walk I take myself 500 years back in time and wonder what was going on here at that time. For some reason the town at night feels to me like Disneyland. We first met Italo (owner of Italo-Italy Fine Leather) in June of 2012 while walking from the town center to the lake promenade. Italo sells fine leather belts and purses, luggage and more. Italos’ leather shop is across the street from the Hotel Vega. Leslie happened to see Italo one morning when she was walking and started talking to him as he speaks very good English. Italo was very friendly and had no qualms about talking to us. Italo and I talked about life in Malcesine and Italy, life in the USA, politics, economics, etc. During our June holiday in Malcesine we talked several times on our way to our morning walks down the promenade. We returned to Italy and Malcesine in October of 2012 and during our morning walk we stopped to say hello to Italo. He remembered us from our holiday in June and we continued with our conversations just as we had in June. In fact, Italo was kind enough to invite us to dinner one night to a tratoria I believe was in Magugnano. The food was great as Italo recommended pasta with pesto sauce and stockfish. The pesto sauce was so different then the pesto sauce in America. It was delicious. Italo and I had a great conversation again discussing business, economics and politics. Italo works very hard and long hours from the time he opens up in the morning until he closes in the evening. All the people I have met in Malcesine very hard workers who work very long hours and would do very well if they worked or owned a business in the USA. In October our 13 day holiday in Malcesine ended and we said goodbye to Italo and he asked me to send him an email when we arrived back in California. When I sent Italo the email he was kind enough to send me a recipe to make pesto sauce. Back in June Italo and I were talking one day and somehow I told him of my love for pastries. He immediately told me I must try the millefoglie made my Lino at Pasticcieria Susy. Italo was kind enough to draw me a map so I could find Lino. Now we have returned in May 2013 and Italo is bringing me special pastries from Affi which is a 45 minute drive from here. I found Lino and his pasticcieria tucked away near the mini golf and asked him for a piece of mille foglie. Lino does not speak very much English but I can speak a little Italian. So when I asked Lino for a piece of millefoglie he said he usually makes it for weddings, birthdays and special occasions. But Lino is such a friendly and jovial man, he wrote something on a piece of paper and told me to come back the next day at 1:00 PM for some millefoglie. Since he only makes it for special occasions I hoped he understood when I said I wanted uno pezzo (one piece) that he was not going to bake a whole cake for me. When I returned the next day I could see all of the cakes Lino had for sale but I did not see a cake that looked like mille foglie. Though I did see one piece of pastry with a piece of paper under the plate. Well, it turns out that Lino made one piece of the millefoglie especially for me. This would never happen in America. By the way, it was delicious. I sat down to eat the millefoglie at Susy’s and Lino asked me if I liked it. I told him it was delicious. He asked me if I wanted to return the next day for another piece. I said yes and he made another piece especially for me. This time Lino sat down with Leslie and I and, with my limited knowledge of Italian, and Linos’ ever more limited knowledge of English we had a very nice conversation about Malcesine. When we returned to Malcesine in October 2012 I made sure I went to Susy’s’ to say hello to Lino and to ask for a piece of mille foglie. Lino remembered me and was happy to make another piece for me and an appointment time to pick it up the next day. When I got my millefoglie the next day I realized that Lino usually makes a whole cake/pastry of millefoglie and instead of making a whole cake he was making just one piece for me. I realized that he was doing this specially for me and that it had to be a lot of work and effort for him to make just one piece instead of a whole cake. So after I had my one piece, when I continued to return for pastries, I just asked for something else I saw that he had already made. Hey Lino, I really appreciate you making just one piece especially for me. The first person to actually say “ciao” to me when I was walking through the town was Simone who works at Arte Cafe in the Piazza Turazza area. She usually works with Ramona who also says ciao to me and waives hello when I walk by the café. I would say I first met Simone in 2006 or 2007 when I would use the internet at the café. I talked to her a little bit and each night I would return to use the internet. One day I was walking through the town away from the café and someone yells out “ciao” to me. Simone had recognized me and was friendly enough to say ciao. In 2009 I no longer needed to use the internet at the café but I stopped by to say ciao to Simone and Ramona. They both remembered me, smiled and asked how I was. Ever since, when we return to Malcesine I stop in the café and say ciao to Simone and Ramona. Like everyone else I see year after year, they both work very hard, yet have time to be friendly to me. The next person to say hello to me when I walked through the town was Isham who is the owner of Malcesine Boats at the harbor in front of the Pizzeria Da Mario. I would walk by Isham and see him every day and, probably in 2010, he started to recognize me as someone he had seen again and again and he began to say “salve” when he saw me. This year instead of just walking by and saying “ciao” to him I went up to him I asked him his name. I see Isham and Nadia (sister in law) working all day long everyday getting boats ready in the morning and then sitting by the harbor all day waiting to rent one of his boats. If you want to rent a boat in Malcesine stop by and say hello to Isham and rent one of his boats. Tell him the guy from California told you to say hello. Cristina is the owner of Parfum de Glace across from the Lago di Garda Hotel and just around the corner from the Café Statuto. I have been going to Cristinas’ for gelato since we first started going to Malcesine. Her gelato ranks up there with the best I have had during my travels. In September 2012 she remembered that I like a 2 euro gelato in the afternoon and a 3 euro gelato at night. I like to think that since I go there twice a day that she gives me a little extra gelato. Again, Cristina has been as friendly to me as everyone else. The day before we were returning to the USA in October I bought my last gelato for the year and told Cristina we were going back to America the next day. She came out from behind the counter and gave Leslie and I a big hug goodbye. That wouldn’t happen in America. Cristina, if you read this, thanks for the extra big scoops? The first time we stayed in Malcesine we stayed at the Hotel Vega owned by Marco (speaks great English). Marco also works long hours and has always been friendly to us. Some people have written on the internet that he is rude but I find that he has a different sense of humor and some people may think he is being rude or mean when he is actually joking with the people. He has a bit of a sarcastic sense of humor which I understand and enjoy. Some people may interpret that as being rude. We have not been able to stay at Marcos’ since 2009 but he still remembers us. In 2012 we stopped by his hotel to say hello. I asked him if he remembered us and he said “of course, room 26 from California”. We like to eat at Da Pedros’ which is owned by Rocco. Rocco, like everyone else, is a very friendly guy. We have been eating there for several years now and we usually eat most of our dinners there. I know he has a busy business with many tourists eating there every year. I think this year he remembered us as he started giving us a bottle of wine every night to take with us back to our room. After a while I had to tell Adela (our usual waitress) that we still had four bottles in our room and if she gave us one more I would have to open up a wine bar in town. Adela is a waitress at Da Pedros’ and over the years she has usually been the person that has taken our order. In September I spoke with her a little bit and, just like everyone else, she was very friendly. In fact one night I went to Da Pedros’ alone and Adela asked where my wife was. I told her she was feeling sick. When Leslie and I returned to Da Pedros’ a few nights later Adela remembered Leslie had been sick and asked Leslie if she was feeling better. One day while walking in town I saw Adela for the first time while she not at work at Da Pedros’. I almost didn’t recognize her as she looked so relaxed and carefree. Da Pedro’s is a very busy and hectic (I assume for the worker’s) trattoria and I can see that you have to be on top of your game to work there. Like everyone else Adelana is a very hard worker, she would earn a lot of money in tips as a server in the USA. 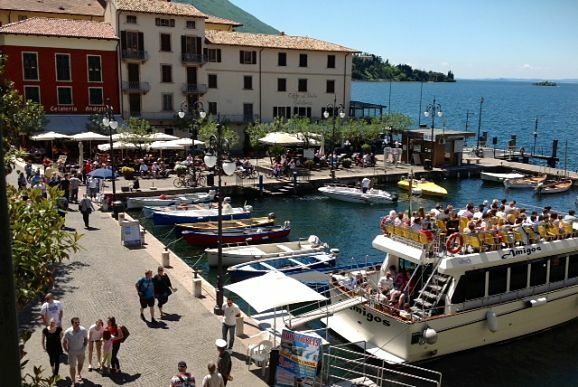 In June 2012 we stayed at Hotel Lago Di Garda for a few days. The owner is Mariana (spelling may be off) who is originally from Scandanavia. In fact it turns out her nephew is Rocco. Well when we returned to Malcesine on lake Garda in October I was walking through the town and saw Mariana. She remembered me (even though we only stayed with her 2 nights in June) and said ciao. In fact on another day Leslie and I were talking to Italo outside of his shop and Mariana went by on her bicycle. I yelled out “ciao” to her and she turned around and came back to talk with Leslie myself and Italo for a while. My wife loves the Bruschetta Pizza at the Hotel San Marco, owned by Lidia and Livio. Their son Stefano is always there to greet us with a great big smile and a hug. When we were there in October we saw Stefano’s beautiful new baby girl, Lina. His younger brother, Maximiliano attends the university in Verona. When speaking to Mariana one day she mentioned that her daughter is Maximiliano’s girlfriend. What a small world, or should I say town. There are others I see in town over and over who give me a nod, a smile or a “buon giorno” but I do not know their names but I recognize them and they recognize me. For instance, I buy a newspaper every day and ask for a receipt/scontrino (which for some reason in Europe they do not like to give you – some places refuse) from the lady taking the money. When we returned in June she remembered me and gave me a receipt before I could ask for it. I know it is because we are on holiday when in Malcesine (and not working 12 hours or more a day like the people that live in Malcesine), but with all the friendly people and the ambiance of the town I always feel like I am spending my holiday in Disneyland so we keep returning.